As the days of Revelation draw closer and prophecy is both revealed and fulfilled, it is more important than ever for believers to understand the meaning of the characters, events, and symbols in Revelation as well as the appointed time known as Yom Teruah. 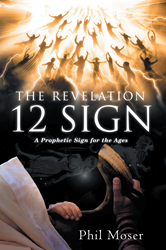 “The Revelation 12 Sign” will elucidate powerful evidence supporting both the interpretation of this sign as well as how God desires his saints to be aware of what is to come. Phil Moser is a retired petroleum geologist currently involved in the prison ministry in Edmond, Oklahoma. As a longtime student of Bible prophecy for over 20 years, he has been most influenced by prophecy teachers such as Perry Stone, Chuck Missler, David Reagan, Grant Jeffrey, Adrian Rogers, Hal Lindsey, Jack Van Impe, and Mark Hitchcock. Moser and his supportive wife, Roxie, were high school sweethearts, and today they have three grown children, three beautiful grandchildren, and three golden retrievers.